The white bass is a member of the temperate bass family, which includes striped bass, yellow bass, and white perch. Adults are mostly silver, with green or gray backs and white undersides. White bass have 5-7 horizontal dark stripes along their flanks. Other names for the species include silver bass, sand bass, or white lake bass. They are occasionally mistaken for or mis-named striped bass, which is the name of their larger cousin. White bass are common in the Great Lakes, including Michigan, Huron, Ontario, and Erie. They are also native to much of the Mississippi River Basin and have been widely introduced elsewhere. Hatcheries sometimes breed and stock white bass x striped bass hybrids, known as “wipers”. 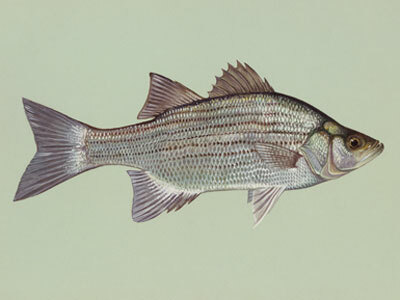 Striped bass hybrids are chosen for stocking due to their higher tolerance for warmer water than purebred striped bass. White bass are also hybridized with yellow bass for stocking purposes. In the wild, white bass x yellow bass hybrids are known to occur.